STEM stands for Science Technology Engineering and Math. These subjects are important but missing one key element ART! We support turning STEM into STEAM. Creative thinking is a skill that can be developed and the best time to start…is NOW! Preschool is the perfect age to introduce STEM preschool activities (or should we say STEAM preschool activities). Did you know you can easily create STEAM activities at home with your preschooler? We have created the ultimate STEAM preschool resource for you and your young learner. AND we are offering a FREE e-course to help you get started! Details are below! STEAM, Preschool Activities for STEM Enrichment is a new ebook that is packed with creative ways to integrate STEM disciplines into everyday fun and learning. STEAM is the traditional STEM + Art, as we feel that creativity is the center of learning and problem solving.Each lesson presented in STEAM, Preschool Activities for STEM Enrichment comes with learning objectives, a material list, easy to follow instructions, and activity extensions. You have a child or teach children three-to-five years old, and you are looking for ideas to integrate science, technology, engineering, art, and mathematics into every day play and learning. You want to provide your child with hands-on, minds-on activities in STEAM topic areas. Purchasing a copy of STEAM, Preschool Activities for STEM Enrichment Will give you 30+ Hands On Minds On activities to compliment and enrich existing preschool curriculum along with downloadable printables for easy data recording. Co-Authors, Amanda Boyarshinov and Jamie Hand are both master teachers as well as experienced parents of preschoolers. You can read more of their hands-on, minds-on activities for preschoolers at The Educators’ Spin On It and Hand Made Kid Art. 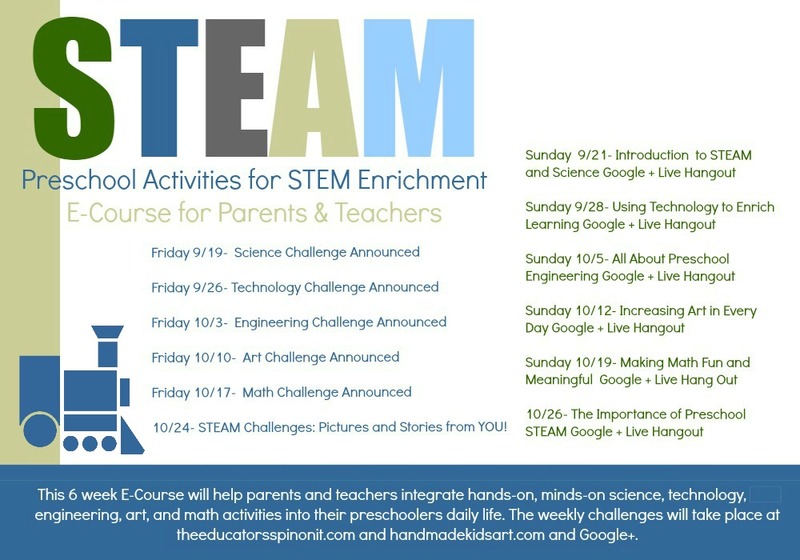 Not Only are we Launching STEAM, Preschool Activities for STEM Enrichment, but we are also offering a FREE 6 week E-Course this fall for parents, teachers and caregivers of preschool age children. This 6 week E-Course will help parents and teachers integrate hands-on, minds-on science, technology, and engineering, art, and math activities into their preschoolers daily learning. We hope you join us and please share on your favorite social media. Ask your friends to join in the FREE E-Course. I can’t wait to *see* you there! I can’t wait to share with our friends, readers, and family! The activities were so much fun to write and do with preschoolers. They were so much fun! I think little ones will really enjoy the activities! 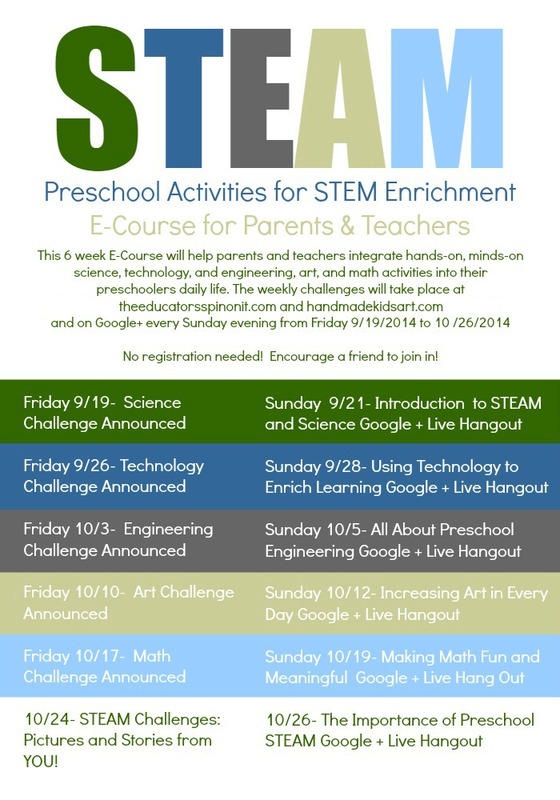 Will you have another STEM E-course for parents and teachers in the near future? Hi Amabelle! We do want to have another e-course on STEAM but there is no date yet. Sign up for our newsletter so that you will be notified when we have another ready. Thank you! Thank for the free e-course. I’m trying to switch careers at 37 (BA in art but been working in HR for last 12 years) and the information here has been very helpful! Great! Thank you for sharing. I am so glad you found it beneficial!